The USTA/Midwest Section is proud to announce that the United States Tennis Association (USTA) has named Purdue University’s Jessica Rink (from Granger, Ind.) as the 2014-15 Tennis On Campus National Leader of the Year. Rink is the first female recipient of this award. Since 2000, this award has been presented annually to the college student who has made significant contributions to the USTA’s Tennis On Campus program in a manner that benefits the well-being of his or her fellow students and the surrounding community. USTA Tennis On Campus will present Rink with her award on Saturday, April 11, at the 2015 USTA Tennis On Campus National Championship, which features 64 coed teams representing colleges and universities throughout the nation. The USTA Tennis On Campus program features more than 35,000 college students competing nationwide in intramural and intercollegiate coed club play using the World TeamTennis format. Since its inception in 2000, Tennis On Campus has grown significantly and today is played on more than 600 college campuses across the country. Developed by the USTA in partnership with NIRSA, World TeamTennis, and the Intercollegiate Tennis Association, the Tennis On Campus program gives college students the opportunity to build leadership skills, network in a coed sports environment and compete on a college team without the rigors of playing in a varsity program. With year-round match play, and regional and national championship competition, students maintain active and healthy lifestyles through their college years. 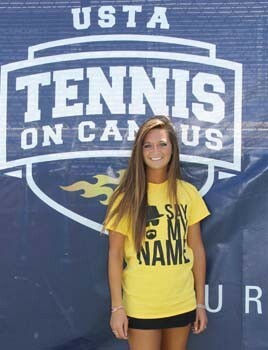 Visit the Tennis On Campus website at TennisOnCampus.com for complete results, stories and photos. In addition, please follow #TOCNationals on social media throughout the tournament.